Bryce Dallas Howard will be playing the role of Victoria in the twilight saga Eclipse which means she will be actress replacing Rachelle Lefevre. Bryce Dallas Howard is the daughter of Ron Howard and appeared in other movies such as “Terminator: Salvation” and “Spiderman 4″. Actress Rachelle Lefevre is still playing Victoria in the upcoming Twilight Saga: New Moon. However due to “scheduling conflicts” she won’t be able to be in the Eclipse movie. The filming of Eclipse next month in August at Vancouver. 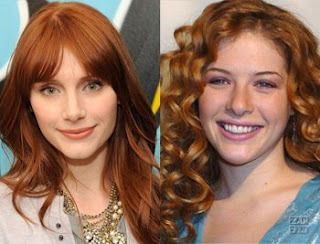 Both actresses have red hair and blue eyes but what is your opinion on changing the actresses on the third movie? Either way Victoria dies in Eclipse according to the Twilight Saga Eclipse book.